Register for one of our SUP classes at the front desk or online here. This payment will secure your spot in the class date/time. If you cannot make the class that you signed up for, please follow our 24-hour cancellation policy, and cancel at least 1 day in advance. This will allow a participant on the waiting list to enroll. Make sure you arrive in the Front Lobby 10-15 minutes early, so that you are sure to be on the water on time. You will need time for parking, paperwork, pit stops, outfitting, and instruction. When you arrive, one of our SUP staff members will meet you at the Front Desk, you’ll sign a waiver (under 18 yrs. must have a parent signature), put your personal items in the locker room or in our SUP shed and continue with your instructor for outfitting and instruction. Wear your life jacket. During some SUP classes your instructor will have you remove the lifejacket for increased range of motion, but this will be after your board is anchored securely. DON’T PADDLE OUT OF SIGHT – Make sure you stay within sight of your instructor. Give way to all powered vessels and kayakers. Paddle on your knees close to shore due to shallow waters. A: Yes! Whether you are a seasoned paddle boarder or beginner, we highly encourage you to take a lesson to learn SUP tips and tricks to make your experience pleasurable and safe. 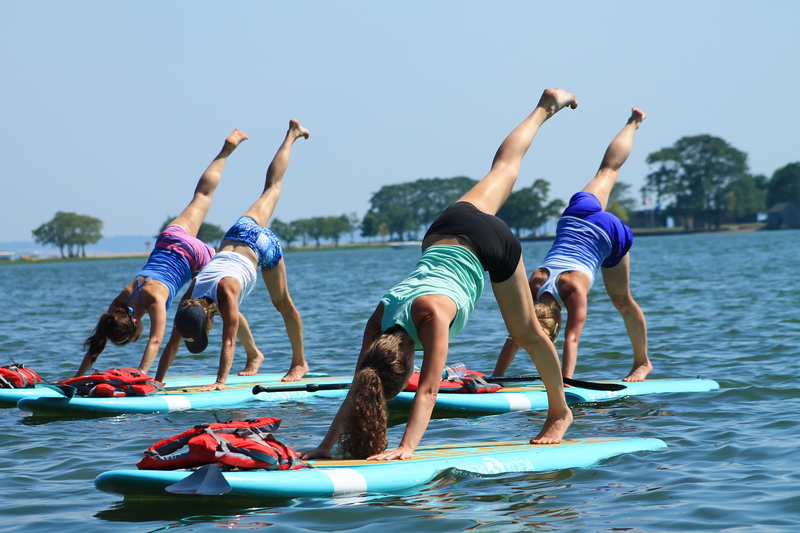 We offer PaddleFit Intro classes here. Q: CAN I BRING MY OWN BOARD, PADDLE, LEASH AND LIFEJACKET? A: Due to liability, we do not allow personal equipment. No need to worry though, we equipped our SUP program with awesome boards, paddles and PFD’s! Q: HOW LONG CAN I GO OUT FOR? A: Our workshops and classes range from 1-2 hours depending on the class, instructors format and introduction to paddle techniques. A: WATER! It’s important to stay hydrated on your trek and during class! Waterproof cameras, in case you want to capture a “Kodak moment”! Cell phone in a water proof bag (heavy duty zip lock bags work well too, but they don’t float!). It’s a good idea to take your cell phone in case of an emergency or if the weather turns! A whistle in case you need help. 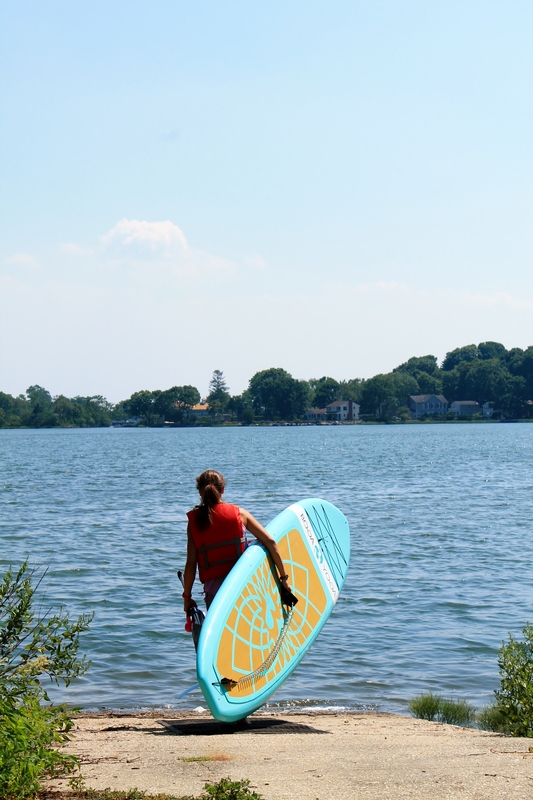 Our boards have an area to safely secure your belongings while on your SUP adventure! A: As long as the wind isn’t strong or over 13-15mph+, and there is no thunder, you can paddle on! We monitor the weather continually and will make all attempts to contact you on your cell phone/email if weather prohibits a paddle board launch. If we need to reschedule due to weather, we will contact you. If we do not contact you, assume your excursion is still on. If the weather becomes unstable during an excursion, our instructors and guards reserve the right (and we have a responsibility) to end the excursion early for safety purposes. If the class was not 100% completed, we can issue a credit for the unused portion. A: We do not refund any class purchases, however, you can reschedule if needed within up to 24 hours before your class. We do not reschedule classes or provide refunds unless there is a 24-hour cancellation. Once you decide to go out on the board during class, we do not approve a refund. If you come back earlier than your class time, we do not give a refund for the remaining time. In the event of a thunderstorm or heavy rain on the day/time you are scheduled to SUP, you will be able to reschedule your class reservation or get a full refund. Q: WHAT IF I FALL IN? A: On average, less than 10% of paddle boarders fall in. The small percentage of folks who do fall in find it’s not that bad and quite exhilarating. You’ll have a life vest on too!